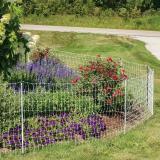 Prefabricated, ready to use, lightweight garden and critter fence. Hand tension is all that is required. 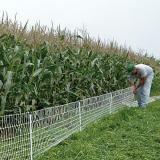 Line posts are already built into the fence and usually can be inserted and removed by hand without tools. Very close mesh spacing. 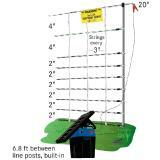 Lowest energized horizontal strands are 2" apart and the verticals only 3" apart. It's short. So it's easy to install and remove. Also, most adults can easily step over it. Highly adaptable. Like all of our nets, they almost self-adjust to irregular shapes, curves, corners, etc. Usually doesn't need extra support posts at ends or corners. 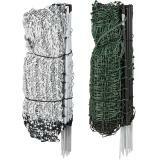 Two colors available: White and black: Most visible. Use when aesthetics are less important. Green: Less visible. Use where aesthetics are important and there is less likelihood of contact by uninformed human visitors. All you need is a VersaNet Kit and an Energizer Kit. (See accessories tab below.) 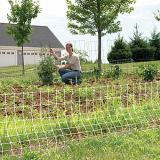 VersaNet kits include 4 extra Posts for corner and end support. 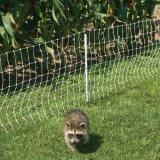 Effective for raccoons, woodchucks, small dogs, rabbits and skunks. Also a barrier to ducks and geese. 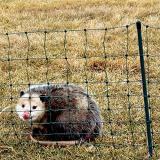 Note: Can also be used for beehive protection to keep out skunks, opossums, raccoons and small dogs. Horizontal Spacings 2", 2", 2", 2", 2", 2", 4", 4"
Easier to step over and costs less per ft than VersaNet 30. Easy to move. Choice of 2 colors. End posts act as built in gates if needed. We used this as a barrier to keep wild geese from coming off of a pond and onto a lawn (the excessive goose poop was becoming a nuisance). It kept the geese off the land and since we used the dark green net, it blended into the background and didn’t clash with the local landscape. The 20” height tends to not sag as much as our 30” VersaNet. 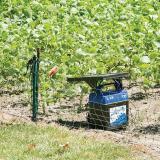 It stopped a deer in its tracks even though I bought it to keep the rabbits out of my garden. I came close to the fence and the electricity jumped to my very close finger. I know why the deer wont come back. It is very well built and stands up straight. 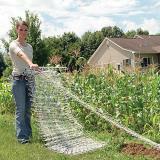 One suggestion is to pull the bottom and top tightly when pushing into the ground. I already had one 50 foot section so this year I decided to buy another to completely enclose my garden. It keeps my plants safe from all the varmints that like to eat my vegetables before I do. Very easy to step over and so much easier on my old back than using the heavy duty poultry netting we bought for my wife's chickens. Squirrels discovered my garden this year, and took every single peach and tomato from my garden before they were ripe. I tried natural "repellants" (bone meal, blood meal, coffee grounds, vinegar rags, and hot pepper spray) and none of them worked at all, squirrels took every tomato for 3 weeks. 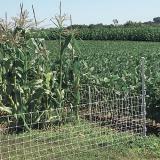 Once I purchased and installed this electric netting/fence, I have not had a single tomato eaten/stolen. This product worked great for me. My peach harvest is gone for the year, but I still have 2 months of tomatoes to enjoy. Looking forward to a squirrel-free garden in 2019. Very easy to install around my garden. Ordered 100’ and it came in 2-50’ sections which is great because I’ve only planted half my garden. 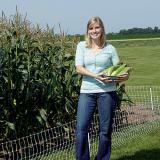 Hopeful it will keep my chickens & other critters from eating & digging up my newly planted produce. Would definitely purchase again. I was tearing my hair out as some type of critter or critters were tearing up my expensive new sod in my backyard! I spent hours researching online and had a chance to talk to someone who recommended Premier1 Supplies. I talked to your Customer Service at least 3 times over a 10 day period, asking a bunch of questions and you guys always patiently answered my questions and helped me find the right product. I was not convinced it would work but after I put it up, miraculously, no more headaches! I saw evidence that those critters came around to my backyard -- as I saw paw prints on my deck that looked like either raccoon or skunk and one morning I opened the windows and noticed a strong smell of skunk. I think he/she must have sprayed after getting dinged on the nose. I've kept up my fence until just recently now that my lawn is deeply rooted and can't be turned over. Sorry for the late review but I wanted to wait until I was absolutely certain that your system works -- it certainly does and I'm so grateful. Thank you Premier1 Supplies!! !